GDI beta report: “Ferris Bueller’s Day Off”. The weather was unbelievably gorgeous on Saturday — better than I could have hoped for. An army* of intrepid beta-testers for the Guerilla Drive-In arrived, prepared to go to any extreme to work the kinks out of the hardware. Fortunately, the extreme turned out to be nothing worse than a chilly evening and a shortage of side dishes for the hamburgers. For the most part, projecting Ferris Bueller outdoors went off without a hitch: the Navy tripod was rock-steady, the gas generator was adequate, quiet, and lasted through the movie on one tank of gas. The film didn’t break, and at no time did the projector erupt in evil-smelling flames. It turns out that my dad had never seen Ferris Bueller(! ), so that was an added bonus. The FM transmitter was a big disappointment — it only had a range of about 10 feet when hooked up to my ipod (even with fresh batteries.) It didn’t seem to work at all when accepting sound from the projector . Wrong kind of sound output? RF interference from the unshielded projector motor? 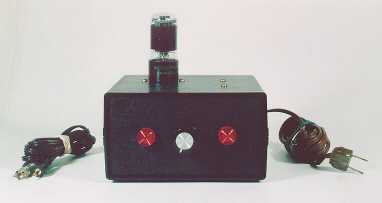 I’d love to hear from anybody who knows how to make FM transmitters put out a signal in not-strictly-approved wattages. Kate’s dad also suggested an AM transmitter, which is a splendid idea seeing as how the sound is mono already. But I think everything’s a go for next month. For that, I have three mysterious words for you: Cato’s Freezer Attack. * Dear Nicole and Dave: now that you have seen what I have described as an “army” of intrepid beta-testers, I am afraid that you have a quantitative metric by which to adjust the grandiose claims made in other parts of this blog. Oh, well, I knew this day was coming. UPDATE: A quick Google search on “AM transmitters” yielded instant results. Problem solved. Check out these links for the build-it-yourself “Li’l 7” transmitter: Oh, yes. Hell, yes. I have to order a glowing tube from a place called “Antique Electronic Supply“? Better and better. Attention, nerd world: I now have a reasonable excuse to attach a rubber whip antenna and glowing vacuum tubes to an ammo can. We perfectly understand how you could’ve thought there was an ‘army’ in attendance, but we should tell you that all that stomping and yelling you heard was just Lex. It’s a talent she has, she can sound like 100 people when she wants to, I hope she can somehow parlay it into a career later in life… preferably one that will financially sustain her parents.